Interesting - so will the circumference/diameter of PS4 stage suggest the circumference/diameter of the Indian crew capsule? Uh, because the ISS is a white elephant which has sucked up the budget of NASA and other space programs? I don't see the Chinese eager to get onboard with the ISS, even if they were invited. Thanks for that antriksh. I think that's a good common sense approach. Although the current capsule design may be limited, the addition of an orbital module would make it much more capable. Tests for sending India's first manned mission into space are in "advanced" stages with the Indian Air Force (IAF) developing necessary parameters for selection of suitable candidates. The tests will need another year to get fully validated and the selection process of the people for the manned mission will begin after that, Director General Medical Services (Air), Air Marshal Anil Behl told PTI here today. hazy ISRO OV from a presentation slide I found on the net. Guessing from the letters on the vehicle, It might be called MANAV (MANned Aerospace Vehicle) which is a Sanskrit word meaning Human being in English. 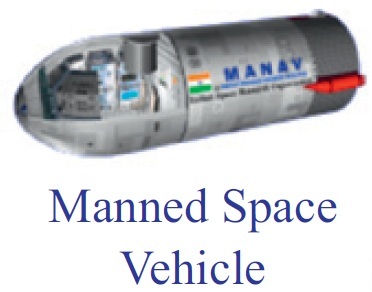 A clearer image after a lot of net research , MANAV is not for Manned aerospace vehicle. ISRO OV for comparision. ISRO crew module ergonomic model and a zoomed in scaled plasma tunnel model for TPS testing. Here ya go - ran that MANAV image through a sharpener to reduce the blur. This is the first time I've heard of this concept design. Any more details on it? What crew size would it accommodate? Why is that cylindrical section so long - what's in there? Thanks sanman! I found this pic from the attached slide on ISRO tech roadmap by BN suresh. I could not find any further details. My guess is this vehicle is combination of front section or reentry crew module + middle section or orbital module + aft section of service module. This might be a long term plan of a manned space vehicle for conducting micro gravity experiments and exploration. Hmm, unlike Soyuz or Dragonlab, I don't see any solar panels on this MANAV concept - I wonder why. Maybe it wasn't fleshed out enough. I think everybody else has solar panels on their orbital designs, if I'm not mistaken. Hmm..... looks like the Indian manned spacecraft is currently ahead of many of the American spacecrafts under design. Hrm? In reference to what? India has quite a ways to go before any such statements are worth while, thought I do wish them the best. Oops..... it was meant to be a satire remark on how those Indian newspapers and even some people at ISRO speak of flying human in orbit and beyond as if they are already ready to go, when in fact such a decision hasn't been made yet and it won't reach its goal in at least this decade.....apparently it didn't work. thanks for the upload, but what is the source of your information? Is there any plan for a sub-orbital flight ?